Error logging – Enhancements have been made to trap Email error events in our database so that the support and development team can refer to the logs in the event of problems and questions. Link to Live Support is provided by selecting the Gear on the configuration menu. Email Tracking Toggle – ZynBit allows the gathering of information about Email opens and displays this information below contacts in the ZynBit task pane. Use the Toggle for Email Tracking Enabled (in the image above) to toggle this feature off and on. 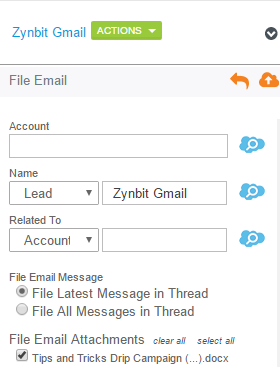 Filing Attachments – the ZynBit Gmail interface now supports filing attachments in Salesforce together with the email. The email attachment option is only shown when the email has an attachment. 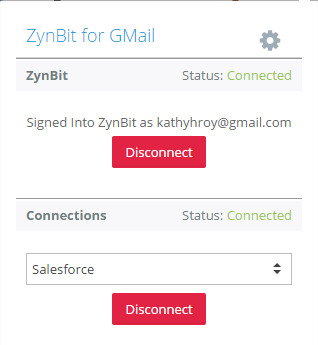 ZynMail is now available to store Emails to SharePoint in addition to Salesforce. 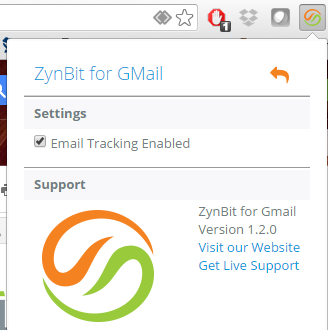 ZynBit Version will be automatically recorded to the ZynBit database for improved customer support and error tracking. For customers using Cases and Orders, the field displayed in the ZynBit Pane was the Field “Name”. Where that is set to an auto-number (like Case Number) the Subject or Order Name will be displayed if available rather that the AutoNumber ID. Premium Features are disabled for customers not using Zynbox for Outlook . In the past, Premium Features sometimes remained enabled after the trial period ended. A problem existed where new events could not be added to Salesforce and ZynBit except from the Calendar interface. This has been rectified and events can be created from the task pane as expected.